When an abuse victim isn’t believed, often times the person who doesn’t believe the victim says it’s because the abuser is too nice or too good of a person. No one so kind could do the terrible things the victim says they did! The victim must have misunderstood, is exaggerating or flat out lying! What the non believing people fail to realize is that this is typical of abusive people, narcissists in particular. Abusers have two sides- the side they show the public & the side they show to those closest to them, their victims. Behaving in such a manner guarantees the victim won’t be believed if she tells others about what the abuser does. People will believe the charade of a good person because abusers are notoriously good actors. Some are even able to convince mental health professionals they aren’t abusive, & that the victim is lying. If someone you know tells you that someone else you know is abusing them but you don’t believe it, please keep this in mind. Don’t brush someone off because the person they accuse of abuse is “too nice” to do such things. If you don’t live with that person, you don’t know the real person! One year ago tomorrow, it’ll be one year since having that huge argument with my parents. That means it’s also been a year since speaking to my mother, & almost five months since speaking to my father. My mother stopped speaking to me after that argument but my father didn’t. He called less & less frequently as time passed, & the calls were much shorter, but he kept the door open with me. I’ve prayed a LOT about the situation this past year. I felt God wanted me to pull away from my parents yet not tell them I want them out of my life. So, I didn’t contact my mother, send her cards or anything. I also haven’t sent my father any cards or called him, but I did take some of his calls & allowed him to visit me last December. Also during this year, God has shown me via dreams & opening my eyes just how selfish & dangerous my father really is. That visit in December really was eye opening for me. My father told me when he was coming to my home, & what we were doing while he was here. That on top of all of the other things that have happened made me pull away even further from him to the point I stopped taking his calls all together, & blocked my parents’ phone number. Apparently this was an issue for my father. He sent several people after me to tell me I needed to call him asap. Thank God, in spite of the nasty old, dysfunctional feelings of needing to do as my parents say, God enabled me to resist contacting him. My point in sharing this story with you, Dear Readers, is to give you hope. When you have narcissistic parents, then learn about Narcissistic Personality Disorder, you realize you need to make changes & it can be scary. You’re going against your parents, which is intimidating! They’ve trained you your entire life to be a certain way or face dire consequences. Even as an adult, the consequences still can be scary. You may even feel you need to go no contact with them, which is even more intimidating. Doing it may feel impossible to you, but I can tell you it is possible. Whichever you are planning on doing- changing your behavior yet staying in a relationship or going no contact- you can do it! You need to begin in prayer. Ask God to show you what to do, how to do it & enable you to do whatever you need to do. Start small.. start setting small boundaries, such as not answering the phone every time your narcissistic parent calls. When the phone rings, pray first. Ask God if He thinks you are able to handle the call or not, & listen to what He says. Say “no” to your parent sometimes. Your parent will hate it, of course, but do it anyway. Say no to small things at first, then bigger things. An example is if your parent wants you to come by Friday, say no- Sunday would work better for you. It’s small, sure, but it’s taking back a little power. If your parent insists on driving when you get together, you say you’ll meet them there & drive your own car. If need be, arrange to have something else to do after seeing them so you have a legitimate reason (in your parent’s eyes) to drive yourself. This is another small way to take back some power. Small gestures like this are a great place to start- they worked wonders for me. Seeing I could take back some power & set some boundaries gave me strength. It made me realize I really didn’t have to settle for being abused constantly. And, as time wore on, I set more & more boundaries. I’m telling you, Dear Reader, these things work. They are a fantastic place to start making healthy changes in your life & relationship with your narcissistic parent. Try them, & see for yourself! It Couldn’t Have Been That Bad! Just Look How You Turned Out! When people learn that someone has been abused as a child, they often say the dumbest things, I think because it’s hard to know what to say. Simply saying, “I’m sorry for what you went through” would be fine, but many people don’t seem to agree with that. So, rather than saying that statement, they can come up with some pretty hurtful & stupid comments. One thing some folks say is, “It couldn’t have been all that bad! Look how you turned out!” Bless their naive little hearts. This actually makes sense to them! People who say this fail to realize that when you grow up with narcissistic parents, you learn early on to hide your problems so as not to “bother” them. Narcissistic parents have no time, energy or desire to deal with their child’s problems, so when their child comes to them with a problem, they ignore, trivialize or even shame the child for having the problem. This teaches the child it’s just best to hide their pain, illness, hurt feelings, needs & anything really from their parents. This behavior carries over into adulthood. Out of habit, the adult child of narcissistic parents continues to hide their problems. As a result, some people look at us & assume we have it all together when the truth is that we don’t! No one can escape narcissistic abuse unscathed. Every single person who was raised by a narcissistic parent or two has had issues from it. Some end up with C-PTSD or PTSD. Some end up with crippling depression or anxiety. Some turn to self harm or self destructive behaviors. Some end up with addictions to drugs, alcohol or food. Some end up overachievers who work themselves so hard, they end up very sick from it. Some even turn into narcissists themselves, continuing the cycle of dysfunction & abuse. Almost all end up with some type of health problems- MS, fibromyalgia, arthritis, digestive problems, heart problems, etc. We are often able to function quite well too, in spite of the problems. Growing up as we did, learning early to hide our problems from our parents, we learned also how to function normally in spite of problems. I went through my life normally for many years even though I was suicidal. No one knew it. I got good grades in school (honor roll, graduated in the top 10% of my class). I held down jobs. I laughed. I lived my life normally, in spite of wanting to die, & not one person had a clue how I felt. Even now, no one, including my husband, has any idea exactly how bad the C-PTSD is when it flares up because I hide it so well. The habit of hiding things is so ingrained in me, I do it without even thinking about it. If someone says to you that what you went through couldn’t have been so bad since you turned out so well, then please feel free to show them this post, if you think it will help. Narcissistic abuse is a serious problem with life long, life changing problems affecting victims. People need to understand this so they can start supporting victims! God gave me yet another experience last night on just how badly He wants to help His children. I realized I needed to write it out but rather than simply write it all in my journal, I thought I would share here in the hopes of blessing you, Dear Reader. I apologize in advance- this probably will be long. A few weeks back, I developed psoriasis on my face, surrounding my mouth. Never had it before-I’ve always had clear, healthy skin- so it’s been rather upsetting feeling like I resemble Freddy Krueger. Immediately I looked up what causes this awful skin condition & how to treat it. For some odd reason, I never thought to ask God about it (not proud of this!). I chalked it up to stress since it started not long after I lost one of my precious cats plus a few days later had the big fight with my parents, & hormone imbalances. But, my husband kept saying how odd the location was. Most people get psoriasis on their arms or backs or chests, but not me. I agreed, it was odd, but had no answers & for whatever reason, didn’t think to ask God about it. Last night, I went into the bathroom to put cream on my face. I looked in the mirror & was glad to see the psoriasis is improving, slowly but surely. I began to wonder why it was where it was, & suddenly, God spoke to my heart, & I knew the answer! When I had that fight with my parents, I broke their rules- I yelled at them & even used some bad language. I had been so caught up in feeling the pain of my loss plus the anger & hurt at my parents, I didn’t even realize I felt guilty for breaking the rules. I also felt guilty for feeling nothing for my parents. Any emotions died for them during that argument- it was my final straw with them. So while yes, stress & hormones played a part in why I got the psoriasis in the first place, my own guilt was why it’s around my mouth- because my mouth was the “problem.” Kind of punishing myself for what I did. The body is a strange yet interesting thing. It can take out its own feelings on itself in very unusual ways, which is what happened to me. Once I put the cream on, I returned to the other room, & got into prayer. Years ago, I read Craig Hill’s book “Ancient Paths” about emotional healing. I used one of his techniques that I’ve found extremely helpful. I asked God if I should feel guilty for how I spoke to my parents. Was I wrong? Was I overreacting? Before I could even finish what I was asking Him, immediately, He said I absolutely was NOT wrong- this was exactly what they needed. They may disagree with me, but they needed to know that they really hurt me with their selfish ways. They also wouldn’t have listened to me if I had spoken in a reasonable way about the topic- they wouldn’t have realized how devastated I was by their behavior. They needed to see their reasonable, normally calm daughter so upset, that she acted totally out of character to understand the depths of how badly they hurt me. Basically, they don’t understand or empathize with my feelings, but they know they hurt me. Apparently that is something God wanted them to know. As I was thinking about this after praying, I had a flashback..thankfully, it was the “mildest” one I’ve ever had. I remembered back to 10th grade. The boyfriend of one of my friends was hit by a car while riding his bike. The day after the accident, everyone in school was talking about it.. in all the gory details. Although I didn’t know this boy well, it was still horrific hearing about what happened. I lost my appetite so I just took my lunch back home after the school day. Later, my mother asked why I didn’t eat my lunch, so I told her. Her response was awful. Rather than show concern for this boy who happened to be the son of one of her friends, or show concern for me being obviously upset, she attacked me. In an extremely shaming tone, she said things like, “You must really like him to be so affected by this.” She shamed me for being romantically interested in this boy when the truth was I was simply upset someone I knew might die from a horrific accident. The flashback reminded me of all the shame I felt that day. Shame for doing nothing wrong! After that, I remembered a similar incident. Also in 10th grade, I took driver’s ed. They showed what were known as “blood & gut” films- footage of the aftermath of car accidents. The premise was to scare us enough to be careful drivers. The films gave me nightmares. One of which involved a fellow student from my economics class dead on the hood my grandfather’s Oldsmobile. I still remember the nightmare- it was very vivid & terrible. Strange too- I barely knew him, so I have no idea why he was even in my dream. When I told my mother of this, her only concern was whether or not I thought this boy was “cute.” Again, I was shamed for being interested in a boy that I had no interest in as my feelings were ignored. As I pondered these awful memories, I asked God what this was all about. He showed me why my mother has acted so outrageously in these instances. She doesn’t genuinely care about other people, she hasn’t the ability to, & is jealous that I do. Also, when I skipped lunch that day, it was proof I don’t have her issues with food (she’s an emotional eater), which was another reason for her to be angry with me. Basically I reminded her of a flaw she has. And lastly, my mother didn’t want me to be interested in boys because that would mean she was losing control of me. If she could shame me for being interested in them, that would prevent me from being interested, & I would remain under her control. Interestingly, by the way, as difficult as this all should have been remembering such nasty things, it wasn’t too bad. I’m a bit tired today & have some mild body aches, but not bad compared to when other flashbacks have happened. God strengthened me & enabled me to handle these things. It was as if He was somehow holding my hand as I faced things. I’m not sure how else to explain it, but I’m truly grateful He enabled me to do this! The reason God reminded me of these instances was to show me that I have no reason to feel guilty. There is no reasoning with my mother. In her eyes, I am nothing but a tool to be used. I mean absolutely nothing to her beyond what I can do for her. Why should I feel any guilt or shame for not being willing to tolerate being treated as such? And, in both of those instances, she was completely unreasonable & she put the weight of her issues on me. This is not a safe person, nor is this someone I should feel bad for standing up to, mother or not. As for my father, he did nothing to defend me to my mother after those instances. He didn’t speak one word to her about her ridiculous behavior. This was typical of him. In fact, he even told me how hard it was for him watching me go through what I did with her when her abuse hit its peak in my late teens. I ended up comforting him when he said that, when should have been comforting & protecting me. All of this really got to the root of some problems, which is awesome. Admittedly, it’s not fun, but to deal properly with problems, you need to get to the root of them. As hard as remembering such things was, I am truly grateful God showed me such things because now I can heal & ditch the guilt & shame I have felt the past two months. Hopefully the psoriasis will heal quicker now too. If God did this for me, He certainly will do the same for you, Dear Reader. He wants you to be healed & enjoy your life! If you allow Him, He will gently guide you on the right road for your healing & strengthen you to face whatever you need to face! And, once you face those demons, you can be set free! There is nothing negative or critical or even dishonorable about discussing your experiences with narcissistic abuse! Don’t let anyone tell you otherwise! Talk about it as you are comfortable. Help raise awareness! Help yourself heal! One important thing to remember though- if you’re seeking validation by discussing your story, you may not get it. Many people don’t understand narcissistic abuse, nor do they want to. Even those close to you may invalidate your pain. You have to accept that not everyone will provide the support & understanding you crave. If you’re worried about the narcissist finding out you’re talking about what she did to you, I understand. It’s scary. Narcissists, in particular narcissistic parents, can be scary, especially during a narcissistic rage. But, keep in mind- there is really nothing they can do to you anymore! Scream at you? Call you names? Talk badly about you to other people? Chances are, after years of it, you’re so used to these things they barely phase you anymore. I understand! As a grown woman, I sometimes get afraid someone will tell my parents what I write about. I remember my mother screaming & raging at me as a kid. When that happens, I remind myself that I’ve experienced her rages so many times, that I’ve become pretty numb to them. I also remind myself that this isn’t just her story- it is mine too. I have every right to discuss it with whoever & however I want to. How can anyone be grateful for being a victim of narcissistic abuse, beaten daily by a spouse, being in a car wreck, losing their home to a fire or even a nasty mother in-law?! I can’t fathom that. I’ve been a victim of narcissistic abuse & other types of abuse by several people. I’ve been physically abused. I’ve been in a car & a motorcycle accident. I even have a nasty mother in-law who has hated me from the day we met, before I was even dating her son. I’m not even close to grateful for going through any of those situations. Not that I’m still angry or bitter about them, but honestly, I’m not grateful for what happened to me. Instead, I am grateful to God. Grateful He brought me through such awful situations & even made sure good came from them. I’m grateful He put it in my heart to learn about Narcissistic Personality Disorder so now I can spot narcissists easily & know how to handle them when I have to deal with them. I’m also grateful God showed me I deserve better than to be treated so badly by people, as I once thought I deserved all of their abuse. If someone tells you that you should be grateful that you were abused or suffered in some way, ignore them. Even if their hearts are in the right place, those words can be so hurtful & shame inducing. Don’t let that into your heart! You are allowed not to feel glad that you have suffered through some rough situations! You don’t have to try to change how you feel! Instead, just remember what you are grateful for- the strength God gave you to survive, the love He showed you as he helped you to heal, the things you learned from the situation, maybe new friends you met at a support group or the love of those close to you who supported you through your painful time. 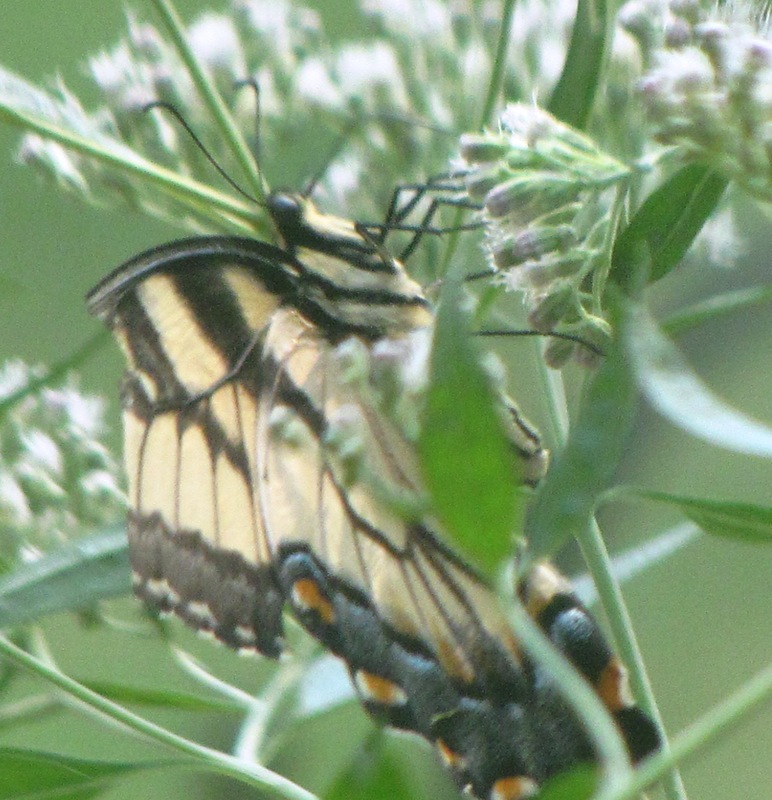 Many of you know this story I shared several months ago that explains my love of butterflies. So keep it in mind as you read this post. 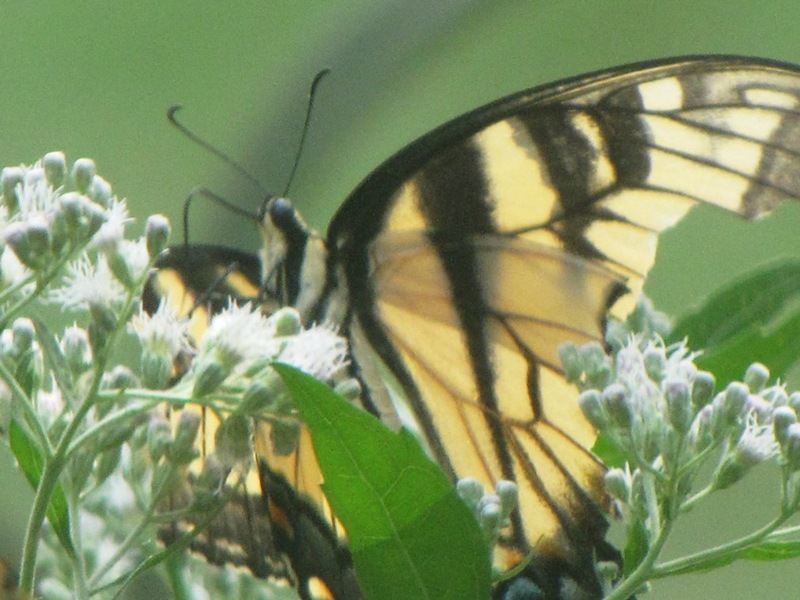 A couple of weeks ago, I was in my living room when I looked out the big window to see a lovely yellow swallowtail butterfly fluttering around the tall plants outside the window. Naturally it made me happy, as butterflies always remind me of my granddad, who I adore & still miss even though he’s been gone for 12 years now. I kept watching the butterfly & realized something looked different. I took a bunch of pictures from inside the house (was afraid if I went outside, it’d spook him away) & in the pictures, I could see the butterfly had a damaged wing. A few more pictures revealed the other wing was also very damaged. I was stunned! The butterfly flew so much like any other butterfly, it was hard to notice there was a problem. 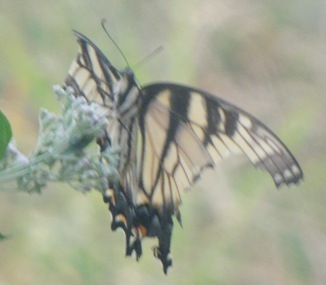 And, I realized that this butterfly was just as beautiful as his counterparts whose wings were whole. Actually, to me, he was even more beautiful since he carried on in spite of his injuries. That butterfly was such a wonderful reminder that in spite of damage, one can still be beautiful. This turned my mind to other victims of maternal narcissism. So many of us feel ugly because we were told we were ugly. Ugly inside & out. That is not the truth though! The only ugly person is the one who abuses other people, especially her own child. You are not ugly, Dear Reader, in any way! Your narcissistic mother was dead wrong about that! Also, the butterfly with the damaged wings was still able to function. Yes, he flew a little differently than others, but different doesn’t equal bad. The same thing goes for you, Dear Reader. You may be a bit different because of having survived narcissistic abuse, but that doesn’t mean you are bad. It simply means that you, like that butterfly, survived something that was meant to destroy you. If you too were raised by a narcissistic mother, I’m sure you heard some similar shaming comments if you showed any anger as well. The fact is though that anger is going to happen. As you heal from narcissistic abuse, it is definitely going to come up. As your self-esteem improves, you finally realize you didn’t deserve the terrible things that were done to you, & it makes you angry. You realize too that it wasn’t your fault you were abused, which also makes you angry. Holding anger inside at this point becomes very difficult & even impossible. That is actually a good thing because it is detrimental to your physical & emotional health. It can cause anxiety & depression. It can cause high blood pressure, kidney, heart & digestive problems. Even knowing such things, it can be hard for the adult child of a narcissistic parent to find healthy ways to release anger. At first, it can be downright terrifying. She may feel that if she lets a little anger out, she’ll end up losing control of it all & hurting herself & others. She also may feel that if she lets it out, she’ll never stop being angry. Dear Reader, these are simply not the case at all! Anger is a powerful emotion that needs to be heard. It demands to be heard in fact. Even so, there are healthy ways to deal with it. Some people recommend the chair method. This involves standing in front of a chair, pretending the person who hurt or abused you is in that chair, & telling them everything you feel inside about them & their actions. Some people beat up pillows. It’s a good physical release, & you can’t hurt a pillow no matter how hard you beat it. Others swear by writing letters they never send. I have done this with a great deal of success. I let it all out in the letters, then usually I burn them. I found something very therapeutic about watching the letters burn. It’s like my anger went up in the smoke. I also kept a couple of them, which helps to keep me remember why things are the way they are. Reading over my letter helps me if I feel weak & wanting to fix things with my mother. It helps remind me that I can’t do all the work- fixing a relationship takes 2 people. Journaling is akin to writing the letters. No one is going to read what you write, so what better way to let it all out? Although I love the feel & look of a pretty paper journal, for privacy sake, I use an online, password protected one. I am certain no one would be able to read it, so when I need to get anger out, I let it all go in the journal. Perhaps the most effective way I’ve found to deal with anger though is by talking to God about it. He is such a wonderful Father. He listens without judgment or criticism & offers you comfort. He also helps you to purge all of that anger from you, so you no longer stuff it deep inside. The next time you feel anger, I encourage you to try one or more of the suggestions above. They really will help you tremendously. You’ll feel so much better once the anger is out from inside you. Many narcissists will accuse you of doing some heinous act that you have never done, yet they do on a regular basis. Or, they treat you as not good enough, which is how they truly feel inside. A narcissist I once knew stopped speaking to me because she said I lied to her. I didn’t lie to her once, yet I caught her in countless lies over the years. My narcissistic mother in-law always let me know she didn’t approve of or like me, & she was very disappointed I married her son. From what my husband has told me, her mother in-law never approved of her, even to the point of wanting to adopt her first born rather than let her raise her own daughter. Does this type of behavior sound familiar to you? Scenarios like this are very common with narcissists. Unlike the average person, narcissists lack the desire to look honestly at themselves. They can’t handle the fact that they have flaws or insecurities. They refuse to work on improving themselves, & instead prefer to accuse others of doing the bad things that they do. This gives them a way to vent their anger at these flaws without accepting them about themselves. Pretty sick, huh? The reason I’m sharing this with you today, Dear Reader, is so that you understand when this happens, it has nothing to do with you. It has everything to do with the narcissist though. The narcissist is only trying to make herself feel better! Just because she says you are stupid, ugly, or whatever doesn’t mean that is true- it means that is how she feels about herself. Do NOT believe her vile words for a moment! Also, listen to the things the narcissist accuses you of doing. If she says you’re a liar, dishonest, cheating on your spouse, stealing.. you can safely bet that she is doing exactly those things! Paying attention to the things she accuses you of can help you to figure out what she is capable of doing. Do you celebrate the good things in your life? Not necessarily throw a big party over every good thing, but at least revel in your joy for a few moments. Life can be so hard & full of negative things, the good can get pushed aside. It’s very easy to do. However, I would like to encourage you today to start looking for more good things & celebrating them. Focus more on what you have accomplished than what is still left to do. Be proud of the fact you lost five pounds or finally painted your living room. Think about how blessed you are that a good friend of yours brought you lunch when you were sick, or offered to take your child to school when you were unable. Enjoy the fact your spouse took off work on your birthday to celebrate & spoil you. Take a few moments just to think about those good things & feel good about them. Bask in the good feelings for a few minutes. Truly this will help you to feel good, & it will help to cement these positive experiences in your memory by attaching good emotions to them. Experiences with emotions attached stick with us much better than those with little or no emotions. I have stressed many times the importance of taking a break from emotional healing sometimes, as it can be very draining. As much as you need to heal from narcissistic abuse, it can be very complex & deep, so periodic distracts are very important. However, I think equally important is looking for & celebrating the good things. These things our parents did became habits. We learned to do them to ourselves. We became highly critical & negative about ourselves, even trivializing the good things we’ve done. Why continue the abuse that your parents started? Stop it & stop it now! You deserve so much better than that, & you deserve to be happy. Start today by celebrating something good. Take a few minutes to bask in the joy of the blessing or the event, whatever it is. Focus on how good it feels to have received something or to have accomplished something. Even if it’s simply cleaning your house- doesn’t it feel good to have that task completed? Focus on that good feeling for a few minutes. Thank God for the good things. That’s all you have to do.